Nur 15 Etiketten von insgesamt 33 sind hier ausgestellt. Die anderen unterscheiden sich nur in Kleinigkeiten. 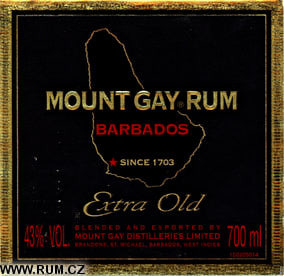 Many people believe that rum was being produced on the Mount Gay Rum Estate from as early as 1663. However, the first surviving written evidence of this is a legal deed dated 20th February 1703. This document lists the property and the equipment found on it, equipment essential for the manufacture of rum. "Two stone windmills... one boiling house with seven coppers, one curing house and one still house." 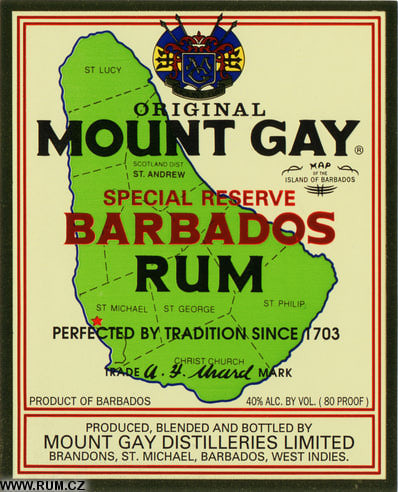 This confirms that rum production was well underway by 1703, making Mount Gay Rum the oldest rum in Barbados, and more importantly, the world. 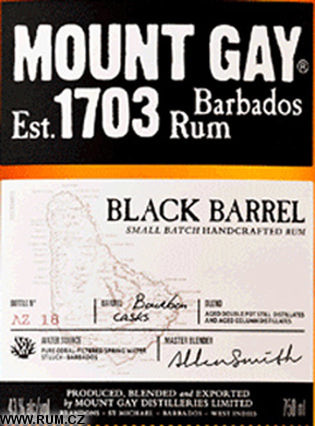 The Mount Gay Rum Estate lies on a ridge in the northernmost parish of Barbados (St. Lucy). In the 1600's this spot was known as Mount Gilboa and was divided into several small, separately owned sugar plantations. They were named after their respective owners: Tyrell, Jemmott, Jones, Pickering and Grey. Then, in the early 18th century, William Sandiford bought most of the land, consolidating it into a 280 acre plantation he renamed Mount Gilboa. It was passed on to his son, who sold it in 1747 to John Sober. Sober and his son Cumberbatch were both absentee landlords, spending most of their time in England. By 1787, Cumberbatch needed someone to manage the affairs of the flourishing Mount Gilboa estate. He chose his good friend, Sir John Gay Alleyne. 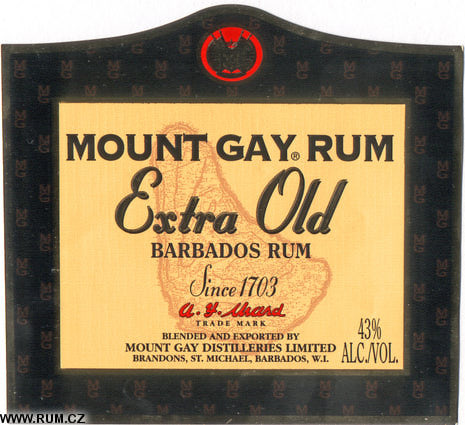 In 1801, after Sir John's death, Cumberbatch honored his friend by renaming the plantation Mount Gay Rum (a Mount Alleyne already existed at the time). The Sober family continued to run the property until 1860. 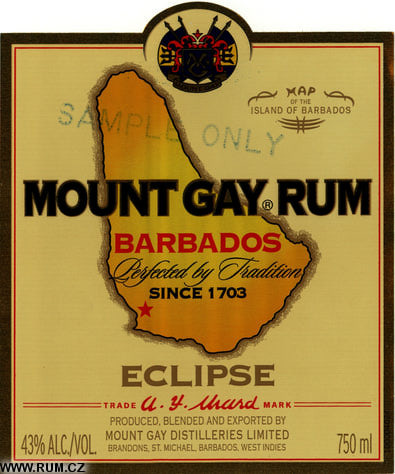 The next major influence on the Mount Gay Rum Plantation was Aubrey Ward, a prominent businessman who bought the estate outright in the early 1900's. 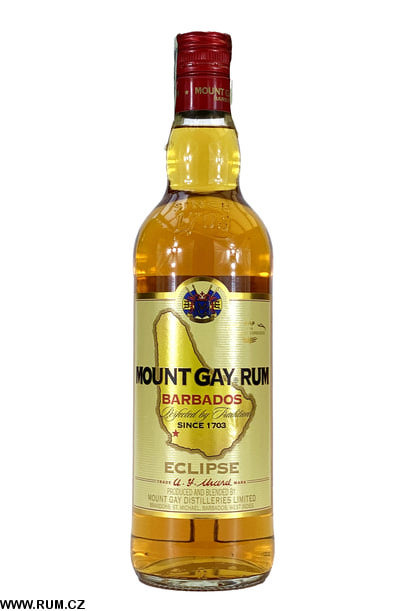 He introduced new methods to meet the increasing demand for Mount Gay Rum, while strictly maintaining its traditional character. 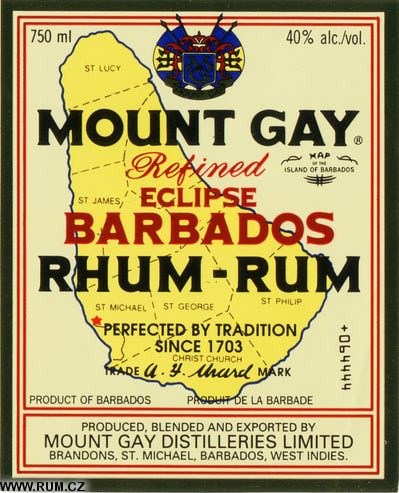 Along with his business partner and marketing specialist John Hutson, he introduced Mount Gay Rum to the international market. These efforts were continued by his son Mr. Darnley DaCosta Ward until his death in 1989. 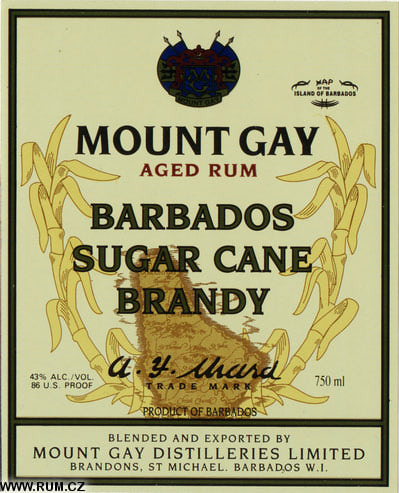 The Ward family continues to be involved with Mount Gay Rum distilleries, majority interest of which was acquired by the Remy Cointreau Group in 1989. This has led the company in a new direction and allowed it to benefit from the French multinational's extensive distribution and international marketing acumen. 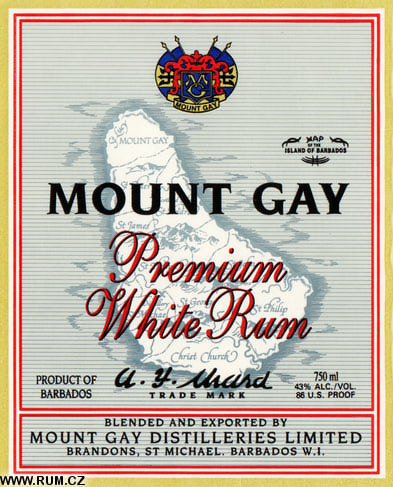 Mount Gay Rum now stands poised for an exciting future, well on the way to being discovered by connoisseurs of fine sprits around the world. 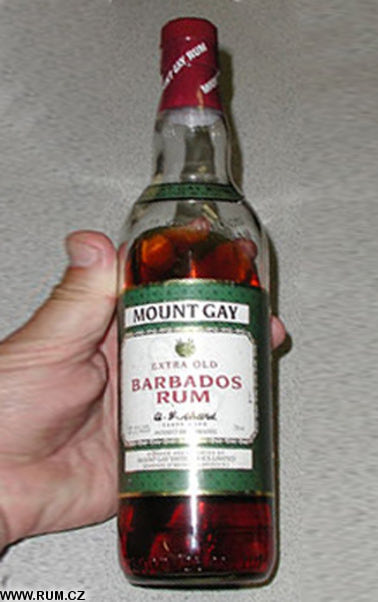 Lieut William Gay and Ensign Abel Gay, both of the Island aforesaid [Barbados] ... bargain and sell unto Major Richard Gay of the same island ... a parcel of land situate lying and being partly in the parish of St Peters, All Saints, and partly in the Parish of St Andrews, Overhills, commonly called the Upper Plantation. The schedule attached to the deed listed the equipment which was part of the sale: one engine or windmill, four coppers, one still, worm (the coiled tube connected to the head of the still) and worm tubb, four cisterns, one curing house, one boiling house, one old mill house, etc. 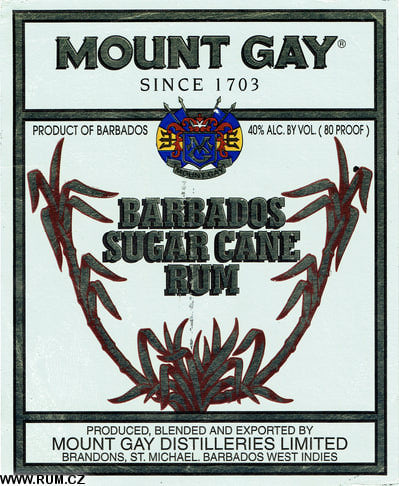 Most of the sugar factories set up in Barbados with the planting of sugar cane from 1640 onwards had means of distilling their surplus molasses or cane juice. 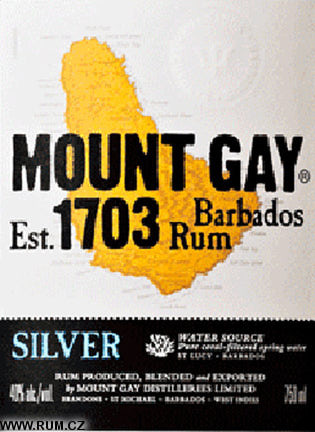 The inclusion of that still in the schedule of 1663 shows that Mount Gay was no exception. 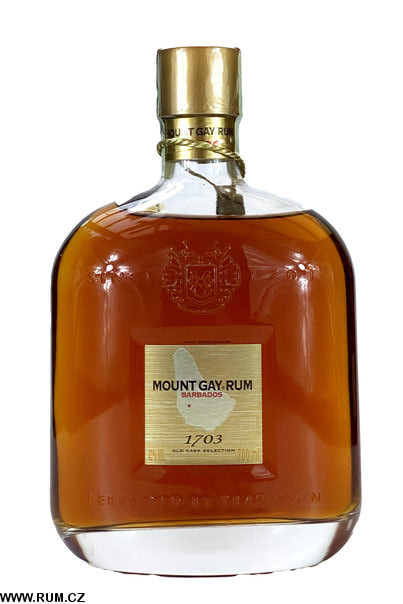 Positive proof of rum production at Mount Gay does not come however until 146 years later, when an entry in a ledger inherited by the Ward family shows that in August 1809 115 gallons of rum were sold to Messrs J & H Goodridge at 2s 7d and 20 gallons to John Gill at 2s 93/4d. 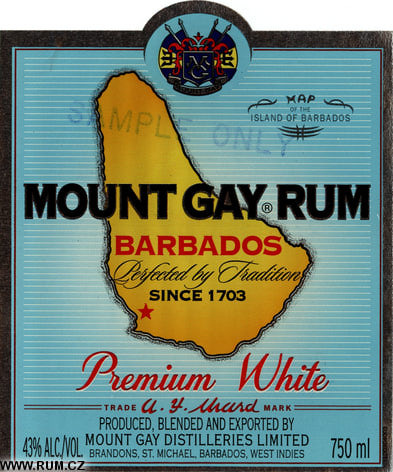 It is a long gap without written evidence ofrum making, but there can be little doubt that it had, in fact, taken place without break since 1663, which in 1983 makes Mount Gay the oldest known rum brand name in existence. 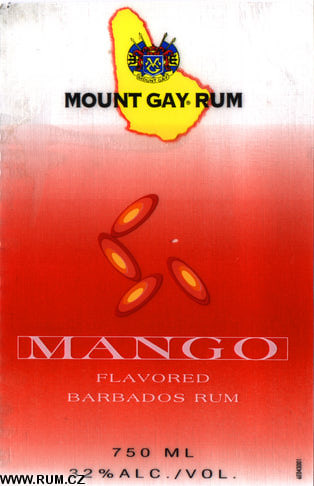 By 1825 the Gay family were no longer the owners of Mount Gay Plantation, though every subsequent proprietor kept the name. It passed into the hands of an Englishman, who also had property back home, called Cumberbatch Sober. In 1860 he sold it to the Thornhill family who never visited it; in 1918 it was purchased by a member of a prominent St Philip family, Aubrey Fitzosbert Ward, who in 1908 had bought from Dr St John the Fairfield Sugar Estate which had gone into chancery. 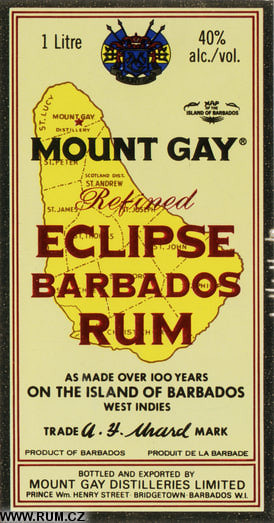 Under that 1906 law those who distilled rum were prohibited from marketing a finished product. 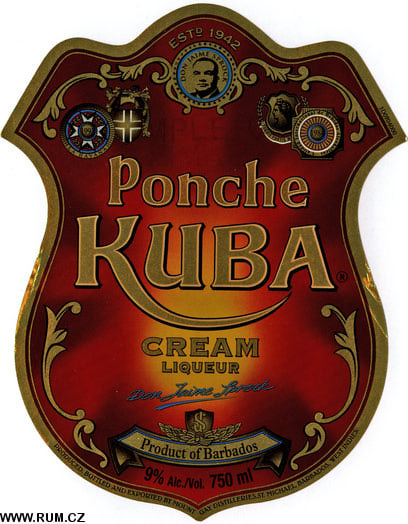 They had to confine their operation to making various types of raw spirit, to the specification of customers who bought them for maturing and blending into a rum which they bottled and sold under brand names of their own choosing. 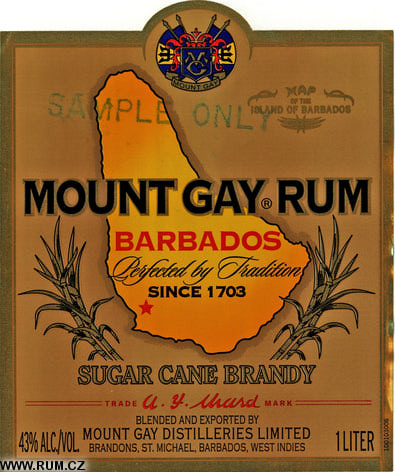 In 1926 AF Ward, John F Hutson and JW Browne formed a partnership in Bridgetown to blend, bottle and market the rum produced by the distillery at Mount Gay, St Lucy. 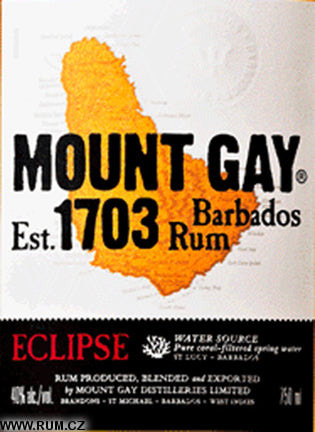 They called this independent company Mount Gay Distilleries (City Branch). 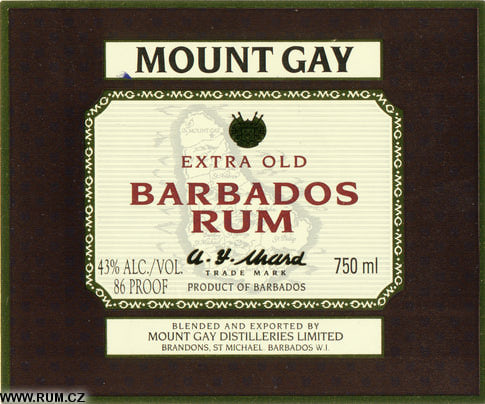 Browne opted out of the partnership around 1930, and it became an incorporated company as Mount Gay Distilleries Ltd in 1942. 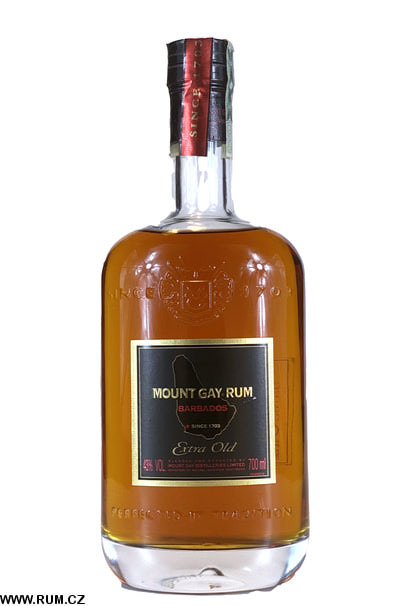 In the following year the distilling company at Mount Gay, St Lucy was also incorporated as The Rum Refinery of Mount Gay Limited. 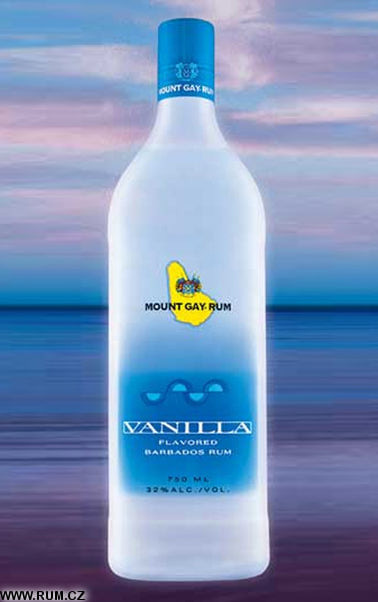 In 1980 Mount Gay Distilleries Ltd, of which DD Ward was Managing Director, sold sixty per cent of its equity to their US agents, Foremost-McKesson Inc, and a contract was made for the supply of rum between The Rum Refinery of Mount Gay and Mount Gay Distilleries. When DD Ward retired as Managing Director of the latter in February 1981, he was succeeded by Irvine Armstrong, remaining however as chairman and a consultant. 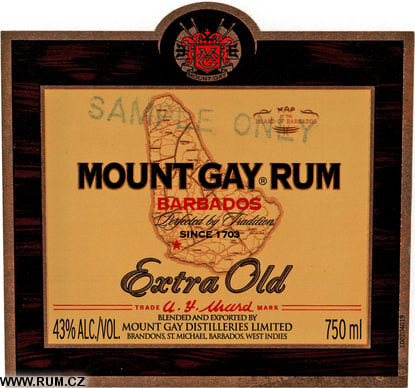 The brand name of the rum they marketed is, of course, 'Mount Gay'. 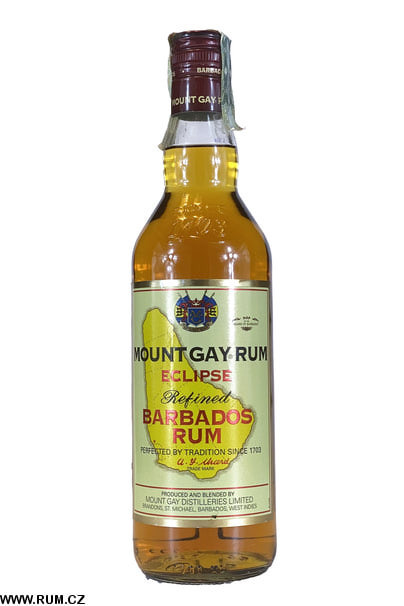 The molasses, supplied by Barbados Sugar Factories Ltd, come from anywhere on the island. But the water which is mixed with them is unique to St Lucy, coming from a well that has supplied the plantation since time immemorial.